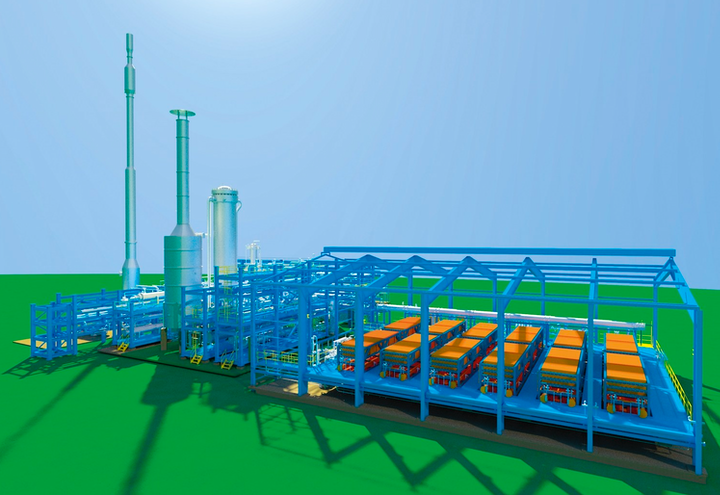 Thyssenkrupp ’s concept of an integrated hydrogen and ammonia plant. The group’s technology will be used at Hydrogen Utility’s proposed hydrogen facility at Port Lincoln in South Australia. DESPITE FEDEREAL LABOR’S pre-election focus on Queensland, Western Australia is likely to be the biggest threat to South Australia's hydrogen ambitions. The Australian arm of the Canadian ATCO logistics and energy group has already received $1.5 mln from the Australian Renewable Energy Agency (ARENA), to help fund a $3.3 million hydrogen innovation hub at Jandakot, some 20 km south of Perth. This will use solar to produce the hydrogen, which will then be trialled in a commercial scale micro-grid, fuelling a range of gas appliances and blending hydrogen into the natural gas pipeline. That, however, is dwarfed by proposals to build the Asian Renewable Energy Hub, the world's largest wind and solar farm, between Broome and Port Hedland. The project, designed initially to export power to Indonesia via a 3,000 km undersea cable, could eventually generate 9GW and cost some $20 billion. It will include energy storage and hydrogen production. The ultimate aim is to provide 6GW of power to Indonesia, with 3GW for the Pilbara region, replacing the natural gas and diesel which now powers the mines, towns and other industries in the Pilbara. The AREH consortium, which is developing the project, consists of the private company InterContinental Energy, CWP Renewables, wind turbine giant Vestas, and the Macquarie Group. The Australian National University and the local Nyangumarta People are also partners in the venture. In Victoria’s La Trobe valley, an international consortium of mainly Japanese companies, backed by $100 mln in Victorian and federal funding, is working on producing hydrogen from brown coal. It is, however, a small pilot project which would produce only 20 tonnes of hydrogen by above-ground gasification of the coal. The $496 mln project has been hevily critiicised on the grounds of cost, and the fact that the gasification wiill also produce more carbon dioxide than hydrogen. It would, however, establish the infrastructure for the liquifaction and export of hydrogen through the Port of Hastings.